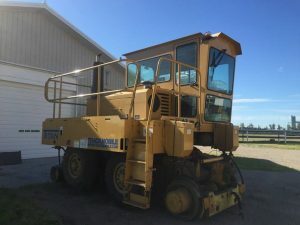 A railcar mover is a road-rail vehicle (capable of travelling on both roads and rail tracks) fitted with couplers for moving small numbers of railroad cars around in a rail siding or small yard. They are extensively used by railroad customers because they are cheaper than owning a switcher locomotive, more convenient and more cost effective. Well-known railcar mover brands in North America include Trackmobile, Rail King and Shuttlewagon. These units borrow weight from coupled railcars to increase the vehicle weight for traction (measured in what’s called tractive effort). The original design included a coupler head that could be operated from the driver’s seat, and that would raise hydraulically to lift the railcar, transferring up to 49,000 lbs (22,680 kg) to the wheels of the vehicle.